As of today, my caller ID is back to normal. Thanks for reporting AlpacaLips. Your userid is a variant of Apocalypse?! APackofLips? Sorry, couldn't resist since we were fresh off the writing topic. And some have said that the resident raccoon is a little strange. The last couple posts really should change their perspective. southsound wrote: And some have said that the resident raccoon is a little strange. The last couple posts really should change their perspective. OK, now you are treading on almost sacred dirt. You see, I not only have my safe room but I have recently installed MindGuard on my Telo. 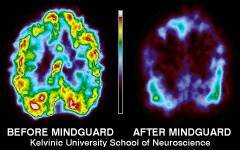 MindGuard is a program for ooma Telo systems that protects your mind by actively jamming and/or scrambling psychotronic mind-control signals and removing harmful engrammic pollutants from your brain. It also has the ability to scan for and decipher into English specific signals so you can see exactly Who wants to control you and what They are trying to make you think. MindGuard works by leveraging your ooma's aluminum-based innards to both detect and emit psychotronic energy using advanced quasi-quantum techniques. Once a mind-control signal is identified and analyzed, MindGuard can generate a specially tuned anti-signal that will jam the incoming signal. If MindGuard is unable to properly identify the signal, it will generate psychotronic white noise to ensure the signal's harmful message is scrambled. MindGuard is fully configurable and can be customized for the individual user using biorhythmic and eponymologic settings. MindGuard also includes an advanced DePsych utility, allowing the removal of almost all deep-burned memetic patterns -- including even commercial jingles. With MindGuard, you can rest assured that your most valuable possession -- your mind -- is safe from the nefarious tinkering of evil-doers. I first learned about MindGuard from this website. At the time, it was available only for Amiga and Linux boxes but now has been ported to run on FreeSwitch. Hopefully there will be a model for Asterisk soon so we can run it on our ooma hub and core devices. I'm going to study this a bit, every man needs a project. Until then instead of mind control I'll just stick with Viagra . I'll respond appropriately soon. OK, now you are treading on almost sacred dirt. A cheaper solution; An Aluminum Foil Deflector Beanie (AFDB) is a type of headwear that can shield your brain from most electromagnetic psychotronic mind control carriers. AFDBs are inexpensive (even free if you don't mind scrounging for thrown-out aluminium foil) and can be constructed by anyone with at least the dexterity of a chimp (maybe bonobo). This cheap and unobtrusive form of mind control protection offers real security to the masses. Not only do they protect against incoming signals, but they also block most forms of brain scanning and mind reading, keeping the secrets in your head truly secret. AFDBs are safe and operate automatically. All you do is make it and wear it and you're good to go! Plus, AFDBs are stylish and comfortable. and removing harmful engrammic pollutants from your brain. It also has the ability to scan for and decipher into English specific signals so you can see exactly Who wants to control you and what They are trying to make you think. That said, I believe the AFDB headgear will do the trick! Of or relating to a genre of film characterized by bizarre or shocking story lines, often shot on a low budget. Based upon the arguments thus far that I suspect contain some technical inadequacy, I propose that your solution is suspect as well. Please ponder your solution to external mind control techniques. Sorry to bring this back on topic, but it appears that my Caller ID is back to "hosed" status. 3/30 1:13 pm through 3/30 8:00 pm: number, but no name! Maybe they're tinkering with it.